The Family Fun Center has been in Omaha since 1982. We were around when Ms Pac-Man was a hot new game. 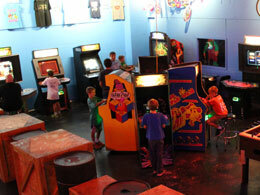 Maybe you grew up coming to play the videogames at our 72nd & Dodge location in the 80s or 90s. Well for all you gamers looking for that nostalgia feeling for yourself or your kids we've got the thing for you! We're proud to offer our new Retrocade, a part of our arcade featuring the greatest games from days-gone-by. Between our stand alone vintage cabinets to the multi-game systems you'll find just about every classic game you could want! Plus we're always on the search for more games to add to our collection. Below is a list of our current games in the Family Fun Center XL's Retrocade. 1942, 1943, Arkanoid, Bomb Jack, Burger Time, Centipede, Congo Bongo, Dig Dug, Dig Dug 2, Donkey Kong, Donkey Kong Jr., Donkey Kong 3, Frogger, Galaga, Galaga (Fast Mode), Galaga 3, Galaxian, Gun Smoke, Gyruss, Jr. Pac-Man, Jr. Pac-Man (Fast Mode), Mappy, Millipede, Moon Cresta, Mr. Do, Mr. Do's Castle,Ms. Pac-Man, Ms. Pac-Man (Fast mode), New Rally X, Pac-Man, Pac-Man (Fast Mode), Pac-Man Plus, Pac-Man Plus (Fast mode), Pengo, Phoenix, Pooyan, Qix, Scramble, Space Invaders, Super Breakout, Super Cobra, Super Pac-Man, Xevious, and Zaxxon. 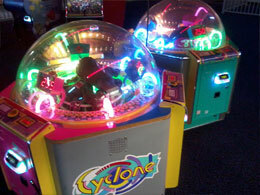 How would you like to blow away the guests to your next party at home with a real arcade game at your next event! The game of your choice will be set to free-play so no need for quarters. Rental is for a 24 hour period. Pricing discounts available for additional days or if you rent multiple machines. We will even deliver it to your door/garage and take it back for no additional charge! 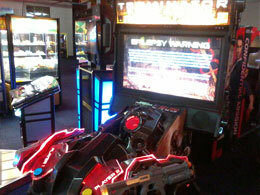 Most of our arcade games can be made available for rent, and every one of our Retrocade games are available. 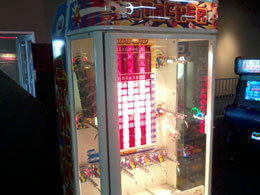 Visit our Game Rental page for more information and pricing. The Family Fun Center XL features an arcade with 100 video, ticket & prize games in addition to our 6 attractions & pizza restaurant. Our classic games section includes dedicated & multicades with an additional 200+ retro games to play! Game Play can be added to your cards in any amount, but the more you add the more BONUS you get for more HUGE FUN! $30 Game Play ... $5 BONUS! $50 Game Play ... $10 BONUS! $100 Game Play ... $25 BONUS! $200 Game Play ... $60 BONUS! Game Play can be used for anything in the building: the entire arcade, attractions (like lazertag) and food. Bonus may only be used for video games (green readers) and attractions.